Hello, friends, and welcome back to “On the Quest for 100!” This week, I must make a bittersweet announcement: this is the Semi-Final Quest Edition. That’s right, all…I am almost there. I am so close to 100%, I can taste it, which means that, next month, in celebration of Breath of the Wild’s second birthday, the #Questfor100 will see its final episode! Wait, no…I am not ready. I don’t want to let go! Oh, well. We knew this time would come. And, while I did not expect it to come so soon, I still have a whole month to jam in some adventures before heading to Hyrule Castle and taking down Calamity Ganon one last time. So, let’s get on with the show! Today, I want to dedicate some time to those adorable little Koroks and their gifts. For those of you who have been with me from the beginning, you might recall that this whole thing began with a Daily Debate asking if completing Breath of the Wild to 100% was worthwhile. Of course, many cited the hunt for 900 Koroks as their main put-off, especially considering that, after 441, there is no practical use for their seeds. I mean, once the inventory has been fully expanded, what use are they? I will admit, going into my follow up editorial, even I was unsure about how I felt. I knew my task at hand was going to be long, and tedious, and, at times, a bit grueling. Back then, I had barely begun to scratch the surface of Korok-finding, and there were still plenty of places my hunt could lead me, but… 900? Really? Especially considering I am fairly certain Nintendo put so many in as one big joke on the players –no, I am not stating this as a fact, just an observation that someone over there has a dark sense of humor. One I can appreciate. Thinking about it all back then, I knew my hunt would take me to new heights, figuratively and literally. I knew I would need to examine pretty much every inch of Hyrule, lift every rock and scale every mountain to find what I sought. I knew I would see more of that beautiful world the more seeds I collected, and still, the task felt daunting. I both wanted to take on the challenge and dreaded it. Now, here I sit, with 898 seeds found, looking back and wondering what all I actually got out of the endeavor. And you know what? I am glad I decided to go for it; I don’t regret seeking out 900 tiny puzzles, seeing those little faces pop up with a bright “Yahaha!” to present me with a small reward. I know Hestu is going to give me a polished gold turd for my efforts, but, once I stopped focusing on the task and started looking at it as an adventure, I suddenly truly understood. Knowing and experiencing are two completely different things, friends. It all became clear to me when, after all my time, all my trials popping acorns with light arrows and moving metal blocks with Magnesis, I stumbled on something I had never seen before. I don’t quite remember which seed it was — somewhere in the 820s — but I honestly thought at that point that I had literally seen everything Hyrule had to hide. Looking at my Hero’s Path, pretty much the entire map was covered in green squiggles. And then, after consulting Zelda Dungeon’s Interactive Map (I cheated a bit, I will admit), I noticed I had missed a seed to the east of the ruins of Castle Town, set my pin, and began my trek. It was a whole little pocket of evergreen trees, complete with pond and bears, that I had no idea existed. Its not like I had seen it once or twice and did not remember. No, I literally had never seen it before! There I was, well over 400 hours into my game, 800+ seeds collected, and I found something completely brand new. I just kind of stared at it for a moment, wondering how I had missed it for so long! I don’t know what I loved more: the beauty of this quaint little place, or the fact that Hyrule wasn’t done with me. It still had secrets left to give. I found my seed hiding around the trunk of a tree, took one last look at that little place, and carried on, the biggest smile on my face. Then… It happened again. I stumbled on the hot springs in Hebra in search of seed 853, on a cold, clear night. Standing in the springs, healing my wounds, I watched the blues and greens of the aurora, wondering if I ever would have seen this place, were it not for my little Korok friend. The Koroks don’t just gift seeds. 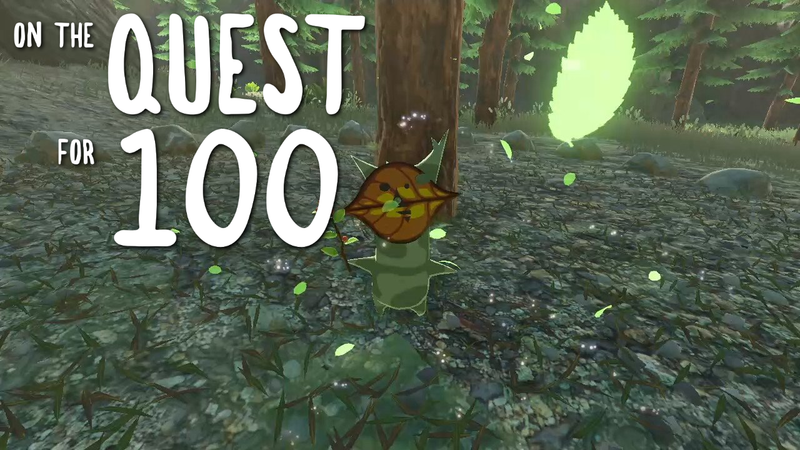 Hestu’s quest doesn’t just end in poop. No. This is about the journey. The discoveries. Finding the secrets of Hyrule. So, let me once more answer my own question. Is completing Breath of the Wild to 100% worthwhile? Even with 900 Korok seeds? Yes. Yes, it has been. Especially with 900 Korok seeds. Only two more to go! Korok seed number 832. Almost got it! And, here is another one for you as a bonus, because I thought the capture was funny. Kat Vadam is a Copy Editor for Zelda Dungeon. Some say this game is a problem for her. She says she can quit whenever she wants. Follow her on Twitter!